Make your Fantasy Football draft feel like a simulated NFL draft. 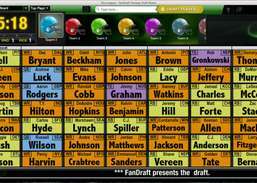 FanDraft Fantasy Football Draft Board software works as a digital draft board for fantasy football drafts. 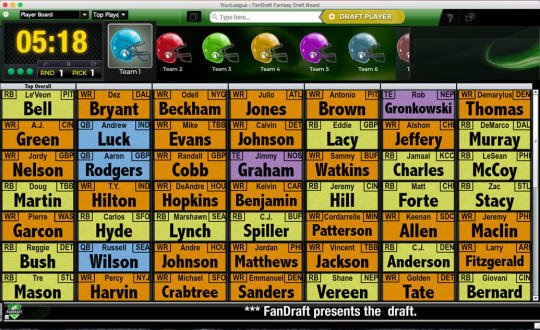 The program includes a player board, a draft clock, and a streaming ticker, voice announcer, integration with MyFantasyLeague.com, and offers customizable draft ordering, team logos, audio, and draft reports. The application works with all types of Fantasy Football leagues, including auction and regular-style drafts. FanDraft Fantasy Draft Board also includes a custom redraft presentation that displays photos, bios, and audio of team owners.